Masterpiece – an equitable name for a classy, eye-catching vault that boosts the extravagant atmosphere of your living room. Shaken off their negative image safes have become trend articles and symbols of good taste and personal style. Nowadays, if desired safes can be much more than “only a secure place to store watches, jewellery, artwork, cash and documents. The high-end brand “Signature Safes by HARTMANN” widens up completely new horizons and countless possibilities: customised safes which meet individual customer requirements – down to the very last detail. The “Masterpieces” play a special role here. They are sovereignly, uniquely individual, do not look like safes at all at first glance, and therefore meet the requirements of even the most demanding individualist. HARTMANN TRESORE has been one of the leading safe suppliers in Europe and the Middle East for several decades. Its extensive product portfolio ranges from all types of safes for private and business use to strongroom doors and entire strongrooms. Though, the “Signature Safes by HARTMANN” are a truly immaculate combination of security and beauty. All safes in this series are especial items built in compliance with the customer’s personal design; especially watch safes and jewellery safes for discerning customers who love of individuality and personal style also extends to matters of security. The climax of this premium Edition range is the series “Masterpieces”: luxury safes that explicitly express the owner’s individuality and taste. Do you already have some ideas for your own private masterpiece? We will be glad to discuss them with you. But first let yourself be inspired by some of the safes we have already designed and built for our customers. 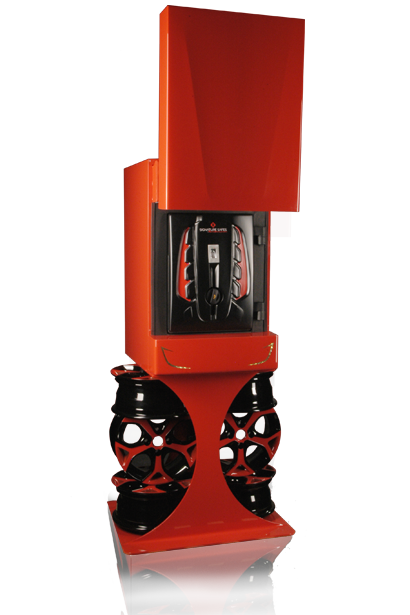 An excellent example would be the safe “Egoiste” which was designed by fashion designer Miklós Schiffer. Exquisite wenge wood and cream-coloured, hand-stitched leather was used to create this oval safe. With many shelves, drawers and watch winders the safe provides substantial space for either valuable watches and jewellery or other precious mementoes. “Egoiste” could easily be seen as an inspiration and model for your own safe – and private masterpiece. The model “Undercover” is undoubtedly one of our most unusual “Masterpiece” safe which has ever left the factory. A stunning piece, painted a glossy scarlet and shaped like the sleek nose of a racing car, with a concealed door. The ingenious biometric fingerprint lock is operated by swiping a finger across a scanner. The perfect safe for a man who has preserved a love of adventure but still wants authentic security. However, there are plenty of other possibilities. Our masterpiece “Python” excels with exceptional features such as its snakeskin-look leather lining, its glass shelves, lovingly endowed, ample drawers and comprehensive LED lighting. This elegant vault also offers space for six watch winders. The “Zeitgeist”, on the other hand – “Zeit” is German for “time”, as well as “age, era” – is dedicated entirely to time (pieces): 56 watch winders assure enough space for a voluminous watch collection, which can be displayed securely but to its full advantage behind the bullet-proof glass door. Our “Masterpieces” may look conspicuously unique, but they all provide security first and foremost. Of course, HARTMANN TRESORE guarantees professional delivery, installation and anchoring of your safe, because a showy safe must be so well protected to prevent any attempts of burgling. HARTMANN TRESORE can – with respect to the relevant technical security aspects – implement any and every customer request consummately. How would you imagine your safe? Should the vault have a certain color and size to harmonize with your interior décor? Should it have a panelled exterior to create the image of an elegant wooden cabinet? Do you want gold-plated or platinum-plated fittings, a thrilling leather look or a front of armored glass, because there is something hidden behind the door, which you would like to show? Or would you like a safe, designed as colorful work of art that harmonizes with a modern and stylish ambience? One thing is certain: A Masterpiece does not have to look like a safe in no case! To perfectly match your needs both the interior and exterior of your vault are customized. Create and develop your ideas – we will help you turn them into reality! When making your plans it is advisable to consider which personal “treasures” you would like to keep in your safe and how much space for them is necessary, however it is completely up to you to decide what you store in your customized safe. The structure and design of a safe are often a result of the special requests the interior must comply, so it never hurts to plan. Is there room for watch winders or are the drawers sufficient? Would you prefer to store gems and jewellery in this vault, for which you need many small and flat drawers? Are they equipped accordingly? Do you need pull-out compartments for precious coins and medals? Or perhaps pigeon-holes for stamp albums? If you would like to keep certificates and other valuable documents in your vault, a compartment high enough for an A4-size folder would be useful. We will be glad to discuss the possibilities with you – in the end, we want your safe to be perfectly equipped and tailored to best suit of your requirements! Safes which are as unique as their owners – that is what Masterpieces are. Customized, highly fancy vaults for exceptional clients who also are concerned regarding security to their own style and personal taste. Masterpieces do not follow any set pattern, but carry the unique, distinctive signature of their owner, give an insight into his or her characteristics and special individual preferences. Let us work with you to create your own personal Masterpiece! Your Masterpiece – a unique safe for a unique personality. Whether it is a watch safe, jewellery safe or Masterpiece – we will create the vault that satisfies your personal wishes and requests in every detail. HARTMANN TRESORE safes are tested and certified to European standard and available in all security grades. Our Masterpieces – simply unique safes. As diverse as the people for whom they are designed.